Celtic have completed the signing of Cardiff's Irish midfielder Willo Flood in a two-and-a-half year deal for an undisclosed fee. The 23-year-old told the club website: "It really is a tremendous honour to sign for a club of Celtic's stature. "I have been a fan of Celtic all my life and this is a dream come true." 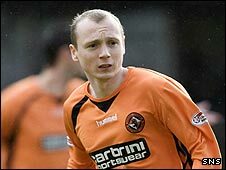 Flood made almost 70 appearances while on loan at Dundee United and was offered a permanent deal at Tannadice, but chose to join his boyhood heroes. Flood started his career at Manchester City where he stayed for three seasons before moving to Cardiff City. "This is an exciting challenge and one which I am really looking forward to," Flood added. "I will be joining a great group of players and I will be giving everything I can to make as big a contribution as possible to Celtic. "I hope to play my part in achieving more and more success for the club and its supporters." United manager Craig Levein was keen to keep the midfielder in Tayside and he and the Tannadice board attempted to persuade him to stay. Earlier this week Flood admitted he would have mixed feelings about leaving the Terrors. And his affection for United was evident after signing for the league leaders. He told the Celtic website: "I would like to thank Dundee United FC for all they have done for me. "I have enjoyed my time there immensely and I wish the club all the best for the future. "My focus is now Celtic and I can't wait to get started with my new club." Celtic manager Gordon Strachan, who watched Flood shine for United in January's 2-2 draw at Celtic Park but miss a penalty in the Co-operative Insurance Cup shoot-out on Wednesday, said: "We are delighted to welcome Willo to Celtic. "He has had a tremendous time at Dundee United where he has shown great ability, drive and enthusiasm. We look forward to working with him."